Garage Door Repairs | Installations | Calgary Alberta – We repair, replace and install garage doors in Calgary. Aladdin Doors of Calgary is a local, family owned business, that takes great pride in a job well done. Doing a good job requires honesty, hard work and most of all respect. The Team at Aladdin Doors of Calgary realizes it's not easy choosing a company that you can trust to allow entrance into your home or business and we don't take this decision lightly. To ensure your trust, we do a thorough background check on our employees and train them on all aspects of garage door systems. We know that if you give us a chance, we'll make you a loyal fan of Aladdin Doors of Calgary. The next time you need your garage door repaired or if you would like a free estimate for a new garage door, call 403-908-0999. We look forward to meeting you. Do you have a garage door that needs repair? Perhaps you want to replace your old opener, a panel has been damaged or your springs have broken. Maybe it’s time to get a new door but which one do you choose? We can help! 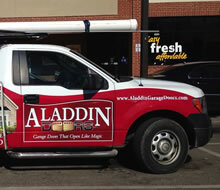 Aladdin Doors® of Calgary specializes in sales and service of garage doors, openers and accessories. Garage doors, sections and accessories from only the top manufacturers. Our expert technicians can handle any type of garage door maintenance, service and repair for any make and model. We carry a variety of replacement parts to complete the job on-site. Why choose Aladdin Doors® of Calgary? When you choose us, you’re partnering with a local, family owned and operated company that’s large enough to serve all of your garage door needs 24/7, but still small enough to treat you as if you were our only customer. Our goal is to make sure you’re 110% satisfied with our services. Call Aladdin Doors® of Calgary at 403-908-0999 today for garage door sales and service. We look forward to meeting you. Many businesses rely on an overhead door system to move their products and materials and house their vehicles. When your door is inoperable, you worry about the downtime and money you’re losing and wonder who to call for fast, quality repair work. We can help! Aladdin Garage Doors® of Calgary carries a variety of heavy-duty rollup (rolling) and sectional doors from Amarr, Clopay and CHI for your commercial, industrial or warehouse application. To compliment your door we carry LiftMaster® garage door operators and accessories as well. When we arrive at your location, we will assess the job and provide you with a written estimate. Work will not begin until we receive your approval. Why choose Aladdin Doors of Calgary for commercial door service? When you choose us, you’re partnering with a local, family owned and operated company that’s large enough to serve all of your commercial garage door needs 24/7, but still small enough to treat you as if you were our only customer. Our goal is to make sure you’re 110% satisfied with our services. If you’d like to receive an estimate to purchase or repair a commercial door system, please call us today at 403-908-0999 or complete the contact form. We will call you just as soon as possible. Why Choose Aladdin Doors® of Calgary For Your Door Services? When you choose Aladdin Doors® of Calgary you’re partnering with a small, local, family run company. 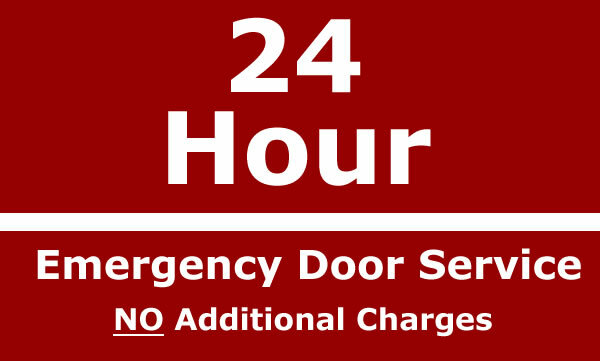 We're large enough to serve all of your door services needs 24/7/365 but we’re still small enough to treat you as if you were our only customer and make sure you’re 110% satisfied with our services.